New York City is the big apple, so I went to town with some Empire apples from the Carroll Street Farmer’s Market this morning. I don’t own a food mill, and I dislike peeling apples because I feel like I am wasting so much food in the process (plus I was feeling lazy). So, I just made this applesauce with the peels. You can peel the apples for a more traditional take on applesauce, but you won’t get this gorgeous pink hue. It will also take a lot longer. Since I was planning on canning the sauce, I wanted to save my time and energy for that step. Applesauce is not just for kids or other people without teeth! I’m looking forward to putting this applesauce on latkes come December. For more fun and seasonal preserving projects , take a look at my strawberry jam post from the spring, or my pickled green beans post from the summer. 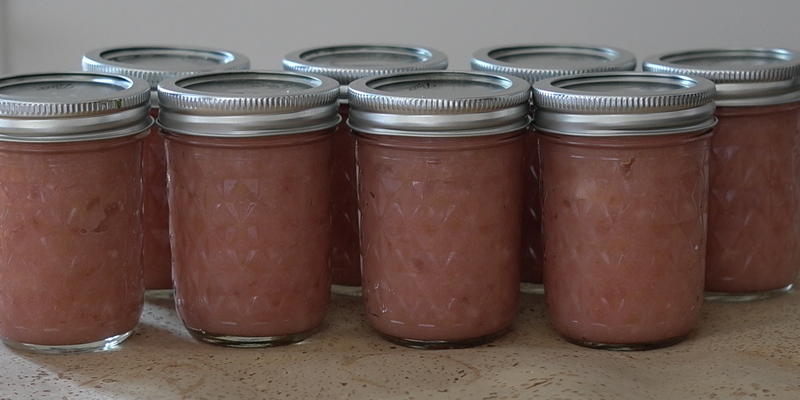 For detailed directions about canning, the Peach Salsa post is the one to check out. Combine lemon juice and water in a very large pot. Core and chop apples into approximately 1-inch pieces, and toss into the pot with the lemon juice mixture as you go to prevent apples from discoloring. Bring to a boil. Then reduce heat, cover, and simmer for 10-20 minutes, stirring occasionally, until apples are tender. Blend in batches in a food processor, or use an immersion blender. Return applesauce to the pot, and add sugar to taste. Heat briefly until sugar is dissolved. Refrigerate and serve within 5 days. Alternatively, you can preserve it in jars for up to a year: I processed 8 half-pint jars in a boiling water bath for 10 minutes.